Johan Potgieter has an EXTREMELY close encounter with a Great White Shark off the coast of South Africa. A follow-up to the recent great white shark cage breach accident video showing the whole story in context. It includes the original cage breach footage and an analysis. Even though the shark gets into the cage, it's not a shark attack. In the moment this was a horrifying shark encounter but it ended good for both the shark cage diver and the great white shark! We can hardly imagine our daily lives without the precise location information we have at our fingertips – on the screens of our mobile phones or computers. 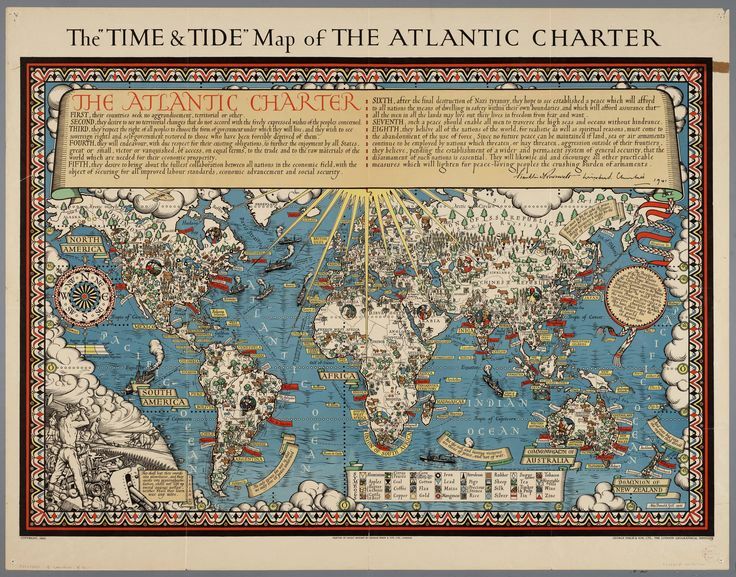 The last century is considered to be a golden age of map-making. It has transformed our everyday lives and knowledge of the world, and the digital revolution continues! 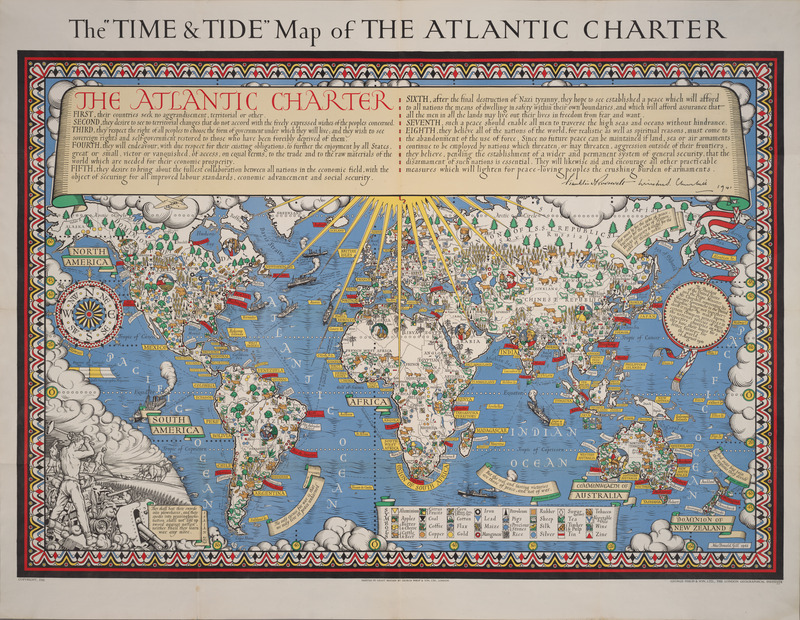 However, before globetrotters could trust digital maps to guide them to faraway places, early explorers had to resort to much simpler representations of the world, often drawing the maps themselves throughout their travels. If you’re fascinated by maps and their history, join us as we outline how early cartographers represented the world as they knew it. Check out our selection of freely to reuse world maps below to see how cartographers found different ways to represent their understanding of our planet. The T-O map represents the physical world as first described by the 7th-century scholar Isidore of Seville. Below a detail of a 14th century 'T-O' map of the world, with Asia, Europe, and Africa marked. Map from BL Eg 1500, f. 3v. Paolino Veneto. The British Library. Public Domain Marked. A mappa mundi is a medieval European map of the world. 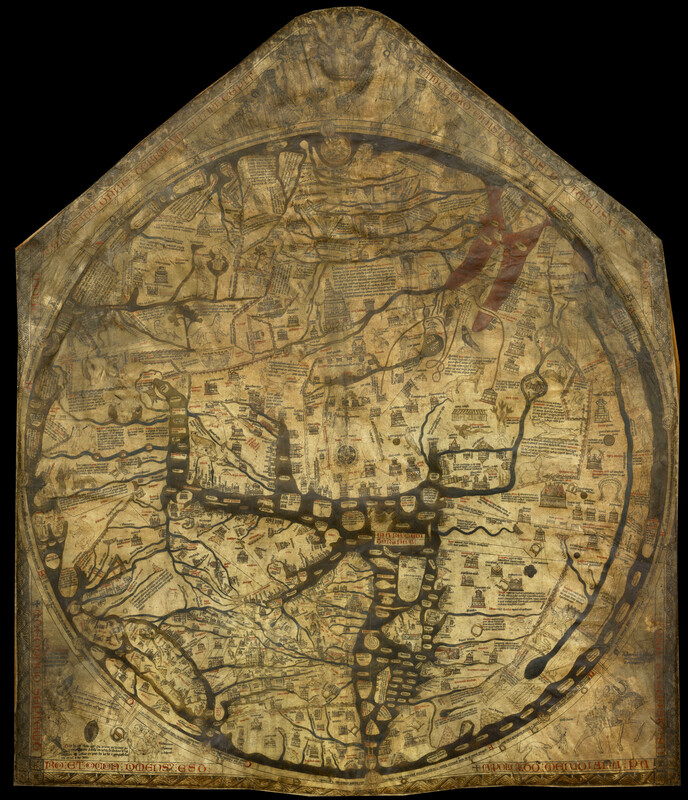 Take a look at a reproduction of one of the world's most famous maps, named after the Hereford Cathedral in England. Typical of many medieval maps, the center of the world is presented as the holy city of Jerusalem. Earth is depicted as a disk and as land surrounded by seas. Richardi de Haldingham seu de Bello Mappamundi inter annos 1276-1283 p. Ch.conspirata Herefordi Angliae consrvata : [Херефордска карта] | Miller, Conrad ed. Based on the account of the traveler Niccolo da Conti to Asia, the Genoese map is a 1457 world map that possesses a Genoese flag in its upper northwest corner, along with the coat of arms of the Spinolas, a prominent Genoese mercantile family. Mappemonde, Genoes world map. 19th century. National Library Of France. An atlas is a collection of maps. Find below a 16th century map from the Water Atlas of the World representing the proverbial "four winds", one from each of the cardinal points - North, South, East, West. Atlas nautique du Monde, dit atlas Miller; 1. [Atlas Miller : hémisphère portugais et page de titre] | Homem, Lopo. Cartographe. 1519. National Library Of France. Public Domain Marked. Next, an atlas containing 32 maps from around the world. It’s divided in two parts: the first identical to the 1650 edition, the second one is an atlas of the ancient world dedicated to Greece and nearby regions. Het vijfde Deel Deo Grooten Atlas verbatende De Water-Weereld (...) 1652. Biblioteca Virtual Del Patrimonio Bibliográfico. CC BY. Finally, check out a 17th century map with two hemispheres, one showing North and South America, the other Europe, Asia and Australia. At the top and bottom there are illustrations depicting the elements "air","fire", "earth", and "water". Karta med två hemisfärer (=halvklot), den ena visande Nord- och Sydamerika, den andra Europa, Asien och Australien. Frederick de Wit (Witt).1660. Skokloster. Public Domain Marked. Two Norwegian companies are taking the lead in the race to build the world’s first crewless, autonomously operated ship, an advance that could mark a turning point in seaborne trade. Dubbed by shipping executives the “Tesla of the Seas,” the Yara Birkeland now under development is scheduled in late 2018 to start sailing fertilizer 37 miles down a fiord from a production facility to the port of Larvik. Using the Global Positioning System, radar, cameras and sensors, the electric ship is designed to navigate itself around other boat traffic and to dock on its own. The first commercial autonomous vessel in the world, and also the first commercial zero ballast vessel. 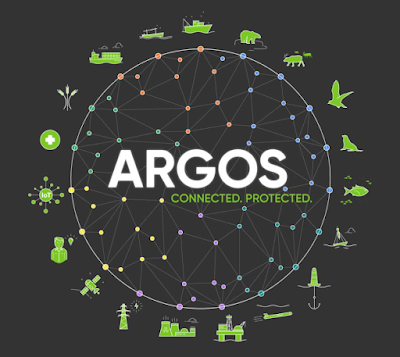 A game changer for the environment and for the shipping industry. The vessel will cost $25 million, about three times as much as a conventional container ship of its size, but its backers say without need for fuel or crew it promises to cut annual operating costs by up to 90%. The 100-container ship is scheduled to be in the water toward the end of next year, though initially it will be tested with a human at the controls. 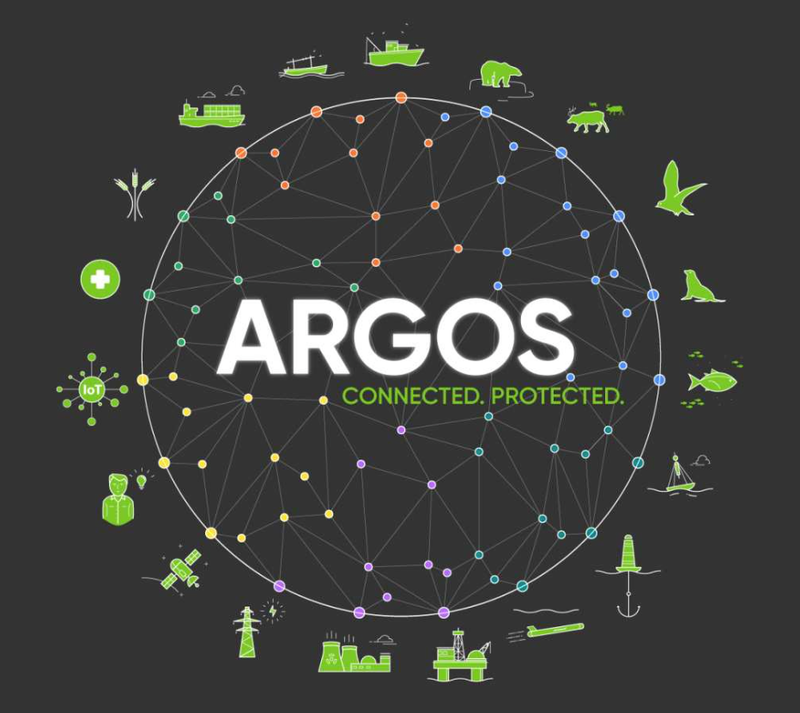 The Birkeland is being jointly developed by agriculture firm Yara International ASA and Kongsberg Gruppen AS A, which builds guidance systems for civilian and military uses. Petter Ostbo, Yara’s head of production who leads the project, said the company would look to invest in bigger ships and use them for longer routes once international regulations are in place for crewless vessels. “Maybe even move our fertilizer from Holland all the way to Brazil,” he said. Companies and universities are working together to develop automated cargo ships. The Wall Street Journal looks at Rolls-Royce’s concepts for the next revolution in maritime transport. The International Maritime Organization, which regulates maritime travel, doesn’t expect legislation governing crewless ships to be in place before 2020. Shipping executives say autonomous vessels will be popular for short sea routes, but doubt they will replace oceangoing ships that move thousands of containers across continents with an average crew size of around 25. “It’s not a matter of technology, which is already there, but a business case,” said Lars Jensen, chief executive of SeaIntelligence Consulting in Copenhagen. In addition to reducing fuel and labor costs, the Birkeland project is being pitched as a way to cut emissions. The ship is expected to replace 40,000 truck drives a year through urban areas in southern Norway, the companies say. Ship operators increasingly are being asked to introduce cleaner fuels when sailing close to populated coastal areas, especially in the U.S. and Europe. “We want to go zero emission,” said Mr. Ostbo. An entire Norwegian fjord now opens for testing autonomous ship technology. Test-site Trondheimsfjorden is right on the doorstep of a world class research community - eager to take autonomous technology to the next level. The Birkeland will become autonomous in stages. At first, a single container will be used as a manned bridge on board. Then the bridge will be moved to shore and become a remote-operation center. The ship will eventually run fully on its own, under supervision from shore, in 2020. “When the bridge goes on land, it will be something like flying a drone from a command center,” said Kongsberg’s chief executive, Geir Haoy. The Norwegians aren’t alone in looking into autonomous shipping. British manufacturer Rolls-Royce Holding PLC is investing in similar technology and plans to launch robotic ships by 2020. The first vessels will likely be tugboats and ferries, with cargo ships that can sail through international waters to follow. “Once the regulation is in place, I can see this spreading fast,” Mr. Haoy said. going the other way at another time. In December 2013, I wrote stories about the “magenta line” on our nautical charts depicting the Intracoastal Waterway, and now lawyers want me to answer questions for a court case on the subject. 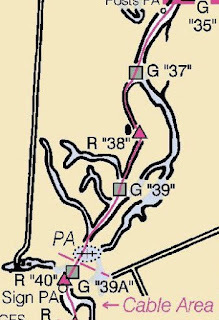 For years experienced boaters have known that the magenta line should be viewed with skepticism as an indicator of depth. 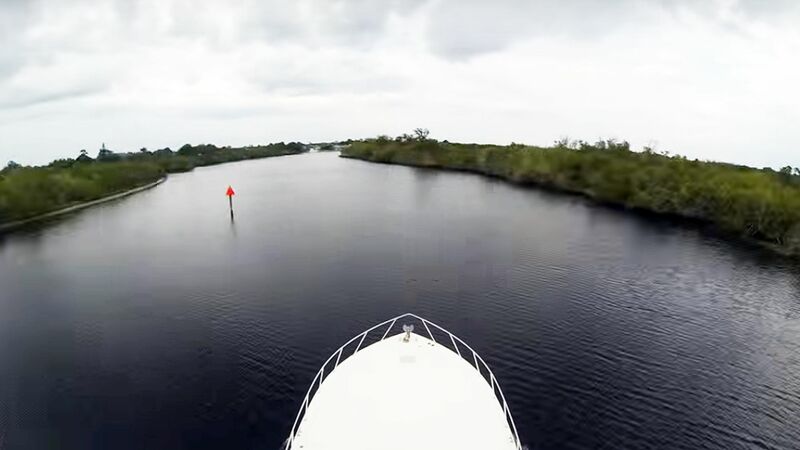 But at the same time they appreciated the fact that it provided an easy way to follow the ICW’s route as it winds through the labyrinthine systems of creeks, rivers, and canals that comprise the waterways of the coastal South. 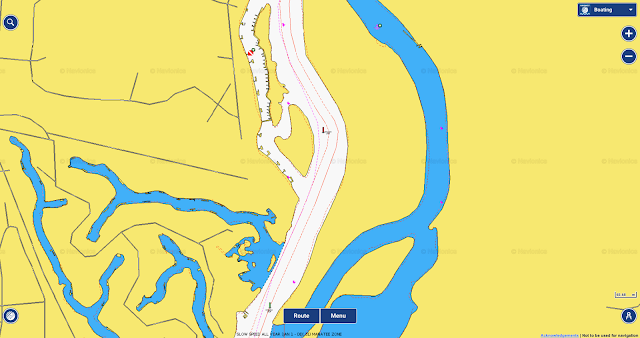 It’s a fact that anyone who follows the magenta line closely enough and far enough will go aground, as I recently demonstrated at a known trouble spot on the ICW at Crooked River in Georgia. The fact that I intended to follow the line until I touched bottom softened the blow, but some hard-charger would have experienced the nautical equivalent of a car wreck. The Feds removed much of the magenta line from government charts, citing safety concerns, but the electronic cartography industry—Navionics, C-Map and Garmin—did not follow suit. Customers like the magenta line, they say. Then came that “hard-charger” I was predicting. 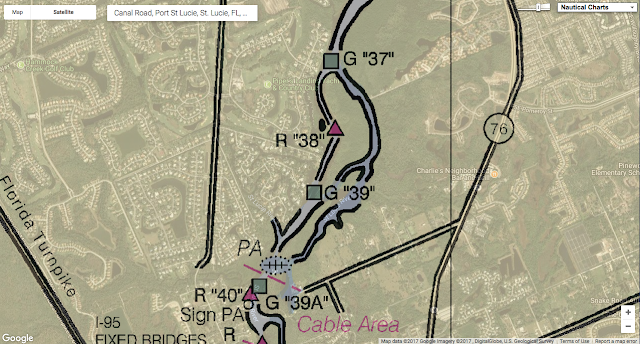 On Dec. 27, 2014, a year after that article, Pedro Torres of Tampa was westbound on the St. Lucie canal at 21 knots. Seaduction, his Wellcraft 36, was equipped with a Garmin chartplotter, and Torres was riding the magenta line as many of us do. Unfortunately the line veered to the wrong side of Red Marker 38, so instead of taking the mark properly to starboard, Torres took it to port. The boat exited the channel and slammed into a shoal. And the result was the equivalent of a car wreck without the benefit of air bags. Torres’ wife Christine was thrown below on impact, suffering injuries to her spine, neck and skull, including a badly bleeding head wound and broken bones. She was airlifted to a nearby hospital in critical condition. Florida Fish & Wildlife investigators concluded that Torres’ inexperience and inattentiveness contributed to the accident but that he had broken no laws. 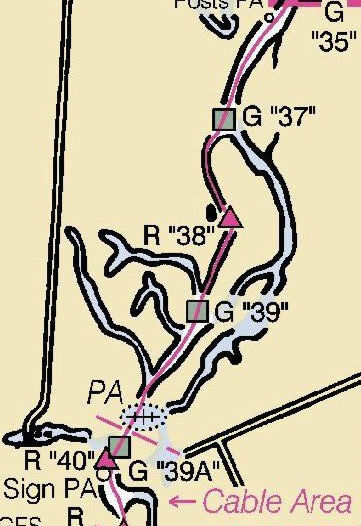 Garmin fixed the error by moving the magenta line to respect Red Marker 38, and prepared to defend itself in court. Pedro Torres, Garmin’s lawyers argue, had behaved like a knucklehead when he mindlessly followed a colored line on his plotter. They insisted that the court assign part, if not all the blame for his wife’s injuries to him in its final decision. Okay, many of us waterway veterans are nodding our heads in agreement right now, aren’t we? But let’s look at it through the eyes of a South Florida jury, particularly after it’s heard from some of the experts rounded up by Torres attorney Michael Eriksen. Andre’s attack goes on and on. Lee Alexander is another witness with a Ph.D and a heavy hitter in electronic charting, theory and practice. His testimony would center on “ground truthing” and the fact that Garmin had the means to determine the accuracy of the magenta line but failed to do so. So what does a jury—perhaps lacking in judgmental old salts—make of all this? Garmin could well have a problem. The government got rid of the magenta line because it was dangerous. Pedro Torres spent, say, $20,000 on a Garmin electronics suite. Why would he not trust his marine chartplotter the way the jurors hearing his case trust the GPS in their cars? By the way, C-Map has a correct line at Marker 38, while Navionics appears to have three to choose from, one of which cuts the mark. I have brought this to Navionics’ attention so it can be fixed. This is the magenta line at the accident scene prior to NOAA's decision to remove the line. Note that the scale of the chart is such that there's no way to conclude that the line might pass to the wrong side of Red Marker 38. Zoom in on an electronic chart, however, and there is literally room for error. So what’s my role in the Torres case? Back in 2013 I made a query to Garmin about the magenta line, which sparked an internal debate. The resulting chain of emails has become evidence in the case. The lawyer for Christine Torres says he wants to question me about the articles I wrote at the time and my Garmin query in a deposition. There are three choices Garmin has. It can eliminate the magenta line from its cartography; it maintain the line as it is now, even though the government no longer stands behind, or it can develop a third option. What is Garmin going to do and why? We know what the answer was. The line stayed put, but not everyone inside the company was entirely comfortable with that. One Garmin employee, Ryan Casanova, was of two minds. But then Casanova agreed with colleagues who argued that as Garmin incorporated NOAA updates in the future, the line would eventually disappear from their cartography as well—not soon enough to save Christine Torres, however. Meanwhile NOAA is working to restore verified magenta lines to its charting section-by-section. I’ll continue to keep you updated about the case of Torres v. Garmin as I await my waterboarding at the hands of the attorneys. 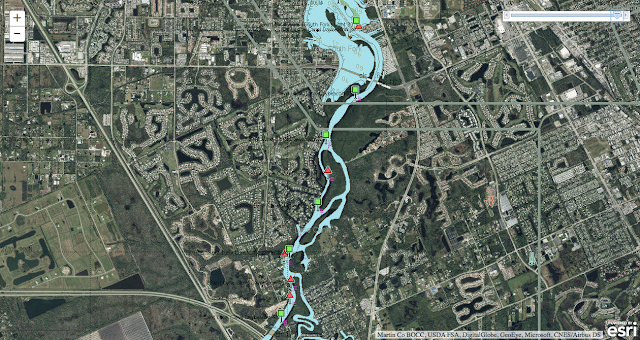 Covering 130 miles and 16 hours of continuous shooting starting at mile 100 of the Okeechobee waterway, a go pro time lapse of the Caloosahatchee River, Lake Okeechobee, St. Lucie River, Hobe Sound and the lights of Palm Beach. 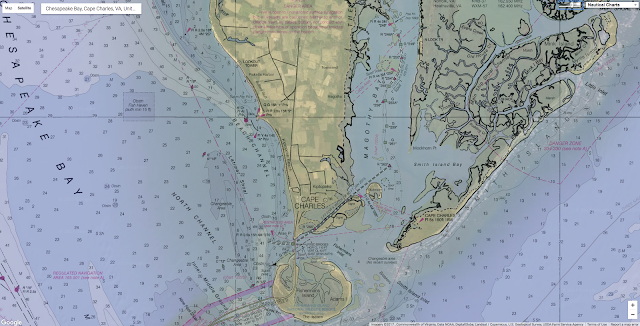 Panbo blog : NOAA erases the Magenta Line, will crowdsourcing step up? Waterway Guide : The ICW magenta line is coming back! Researchers with the U.S. Army Corps of Engineers and various other insitutions work on the ice of the Chukchi Sea. In the background is the U.S. Coast Guard icebreaker, the Healy. This is a field campaign of the NASA-sponsored ICESCAPE. This article is part of an Arctic in Context series featuring Winter 2017 Arctic Research Fellows from the International Policy Institute, in the Henry M. Jackson School at the University of Washington. This Arctic research program is dedicated to improving the transfer of research and expertise between higher education and the policy world in the area of global affairs. “It seemed truly like the ending of a world. Seabirds were dying by the thousands in the muck. This description in National Geographic of the 1989 Exxon Valdez oil spill is meant to be dramatic. As we’ve seen time and time again, oil spills have devastating impacts on the environment, wildlife, and local communities, and the effects linger long after the cleanup crews have gone home. Today, as melting sea ice makes oil more accessible, the risk of a spill is moving north into Arctic territories. While a major oil spill has yet to occur in the Arctic, the Arctic Council began to look seriously at oil spill prevention and recovery after the 2010 Deepwater Horizon spill—the largest marine oil spill in history—which the United States failed to stop from gushing into the Gulf of Mexico and was unable to clean up entirely. If this type of spill were to occur in the Arctic, the lack of major nearby ports and unforgiving weather would make response much more difficult, not to mention the devastation to a delicate and already stressed ecosystem. The Arctic may hold up to 13 percent of the world’s untapped oil, but due to its fragile and dangerous environment, the U.S. and Canada both placed a moratorium on new oil leases in the region in December 2016. However, under the Trump administration, oil allies Rex Tillerson and Scott Pruitt may influence the decision to lift the ban on oil drilling in the Arctic. Fortunately, some preventative measures have been taken by Arctic states. To avoid an Arctic oil spill and to formulate a response plan in the event that one occurs, the Arctic Council and its eight member states signed the legally binding Agreement on Cooperation on Marine Oil Pollution, Preparedness and Response in the Arctic in 2013. Three polar bears approach the starboard bow of the submarine USS Honolulu while it is surfaced 450km (280 miles) from the North Pole. Sighted by a lookout from the bridge of the submarine, the bears investigated the boat for almost two hours before leaving. But even with this agreement, is the U.S. ready for an Arctic oil spill? The agreement is meant to enable cross-border sharing of knowledge, resources, and equipment to assist in the cleanup of large-scale disasters. Rarely do we see preventative policies enacted before a major disaster, especially on an international scale. The agreement states that each country must identify areas of special ecological significance that may be at risk, have appropriate equipment ready to be deployed, and determine who in the government can request international assistance and who in other countries can respond to such requests in a timely manner. The agreement also stipulates that in an emergency, regulatory barriers to shipping across borders must be removed—a direct response to the issues that arose after Deepwater Horizon. But perhaps most practically, countries are advised to carry out joint exercises to improve the ability of responders to work together. In the Arctic, where limited knowledge about the behavior of oil in an icy environment makes the potential effects of a spill difficult to predict, practice is especially important. The United States ratified the agreement in 2016, a noteworthy accomplishment given the challenge of ratifying international pacts in Congress. A cleanup worker walks through the oily surf at Naked Island on Prince William Sound on April 2, 1989, a week after the beginning of the oil disaster that occurred when the tanker Exxon Valdez ran aground and spilled 11 million gallons (42 million liters) of crude oil off Alaska, near the oil pipeline tanker terminal in Valdez Harbor. The first joint exercise with Canada occurred in 2015 before the ratification, solidifying the relevance of the international Arctic Council agreement in U.S. domestic law. The United States has also identified sensitive areas, participated in additional joint scenarios, and ensured oil spill equipment is available. But although the country has made progress, the 2014 consensus from the National Research Council (NRC) and other organizations is that Washington is not fully prepared for the all the unknowns that come along with an Arctic oil spill. To Buck Parker, a member of the U.S. delegation that helped draft the Arctic Council’s agreement, one of the largest issues with the Deepwater Horizon incident was the United States’ difficulty accepting help from other countries. While other countries offered resources and equipment to stop the spill and work on cleanup, questions arose about whether these offers would violate U.S. coastal shipping laws. France, for example, offered oil dispersants that are not approved for use in the U.S. This specifically raised concerns about the Jones Act on international shipping and whether this law was hindering the United States’ ability to accept aid for oil spill cleanup. Part of this coordination must be directed at gathering more information about what an oil spill in the Arctic would entail. The NRC report’s recommendations reflect the Arctic Council’s push for joint exercises, and it advises that experiments with spilling oil in the Arctic will be necessary to better understand how oil behaves in cold and icy environments. Further, mapping and monitoring of the Arctic Ocean need to be improved: Updating nautical charts, mapping the coastlines and seafloor topography, and collecting other data could be vital for ships to efficiently respond to a spill. Research from the NRC shows that increased U.S. Coast Guard presence would allow for a faster response to a spill given the remote location of the Arctic. It is unclear under the Trump administration whether the Coast Guard budget would allow for an increased presence. Shell's drilling rig Kulluk ran aground in the Arctic in 2012, and the company abandoned exploratory drilling in the region in 2015 after finding little oil or gas. As of now, the closest U.S. Coast Guard station to the Arctic is in Kodiak, Alaska, more than 900 air miles and 2,000 nautical miles away, a trip lasting about five to six days. The Arctic Council’s agreement has laid the foundation for cooperative environmental action, but if the Arctic nations truly want to protect the already fragile ecosystem of the High North and the people who call it home, this is only the start. Given the lack of infrastructure, unpreparedness for response, and lack of knowledge about oil in icy environments, a spill in the Arctic today would likely be worse than the Deepwater Horizon incident. The Arctic Council needs to build on the agreement and nations must follow through on their commitments before drilling begins again. While U.S. and Canadian legislation has closed the opportunity for new lease sales and drilling in the Arctic, the risk remains. The cost of preventing and preparing for a disaster is a small price to pay when compared with the cost of a large oil spill and its long-lasting, catastrophic ramifications.